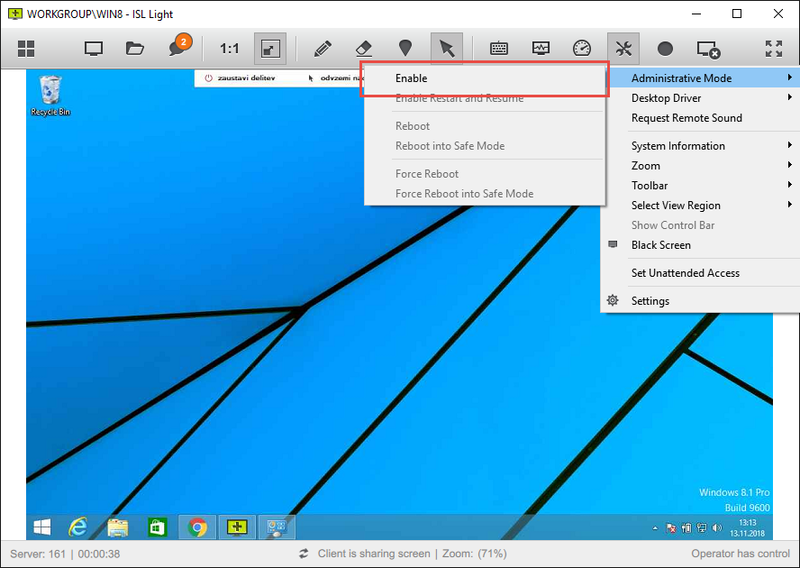 Note: Administrative mode and all its features can currently only be enabled on Windows version of ISL Light. Linux and Mac versions of ISL Light can enable administrative mode and all its features when the remote side is using Windows operating system. 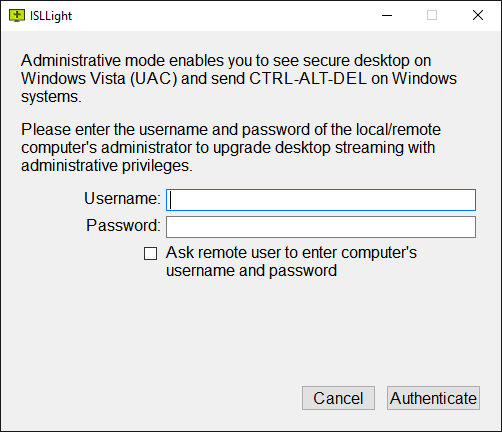 Note: Administrative mode enables the ISL Light user to see the secure desktop on Windows Vista (UAC), to see the Windows login screen and to restart the remote computer. Click on "Enable" to request the Administrative mode. Enter the Login credentials for the administrative account on the remote machine or tick the checkbox and ask the remote user to enter them. Important: Step 2 only applies if the current account on the remote machine does not have the administrative rights. If the account is administrative the remote user will receive an administrative prompt asking them to grant privileges to ISL Light. 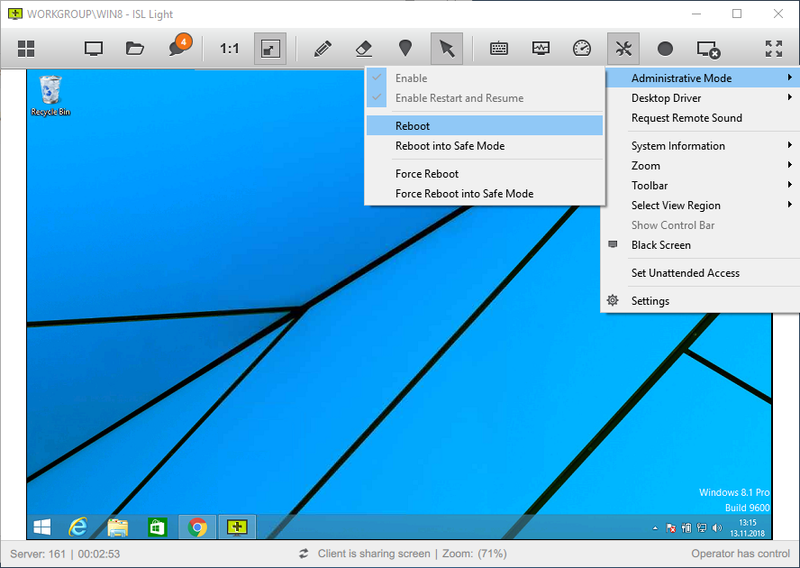 Click on "Enable Restart and Resume" option to turn on the Restart and Resume functionality. 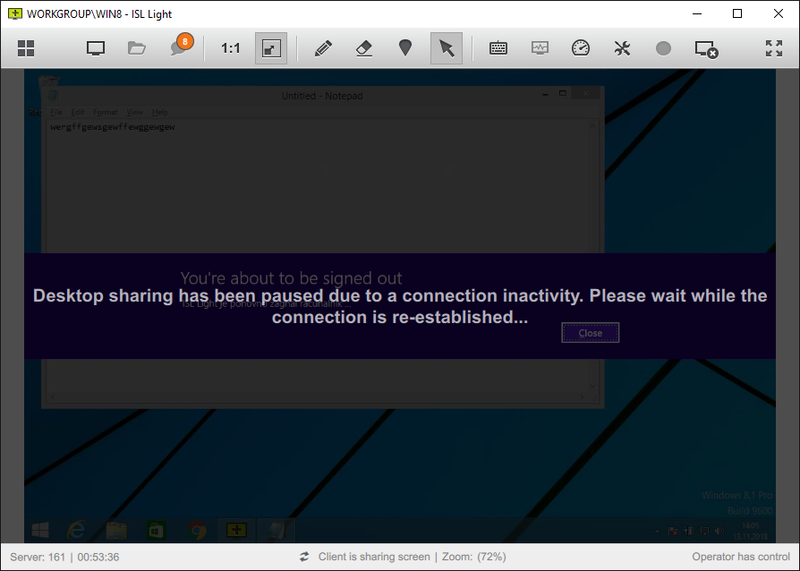 Note: Restart and Resume offers an extended functionality to Administrative mode and is not enabled by default as soon as the Administrative mode is enabled. e.g. Administrative mode is needed to view the Windows login screen, but Restart and Resume functionality is not needed in that case. Reboot - Request the reboot of the computer. After 60 seconds the remote machine will restart and connect back to session. Reboot into Safe Mode - Request the reboot of the computer. After 60 seconds the remote machine will restart, enter Safe Mode and connect back to session. Force Reboot - Force a quick reboot of the computer. Additional parameters are passed to the restart function which prevent active programs from blocking the shutdown. After 5 second delay the remote machine will restart and connect back to session. Force Reboot into Safe Mode - Force a quick reboot of the computer. Additional parameters are passed to the restart function which prevent active programs from blocking the shutdown. After 5 second delay the remote machine will restart, enter Safe Mode and connect back to session.